On a small baking dish or baking sheet lined with aluminum foil, place the tomatillos, garlic, onion slice and chile. Place under the broiler for 8 to 10 minutes, flipping the ingredients once in between, until completely charred and mushy. Watch out for the garlic as you may need to remove it a few minutes before the rest of the ingredients. When cool enough to handle, peel the husk off the garlic cloves and remove stem from the chile. 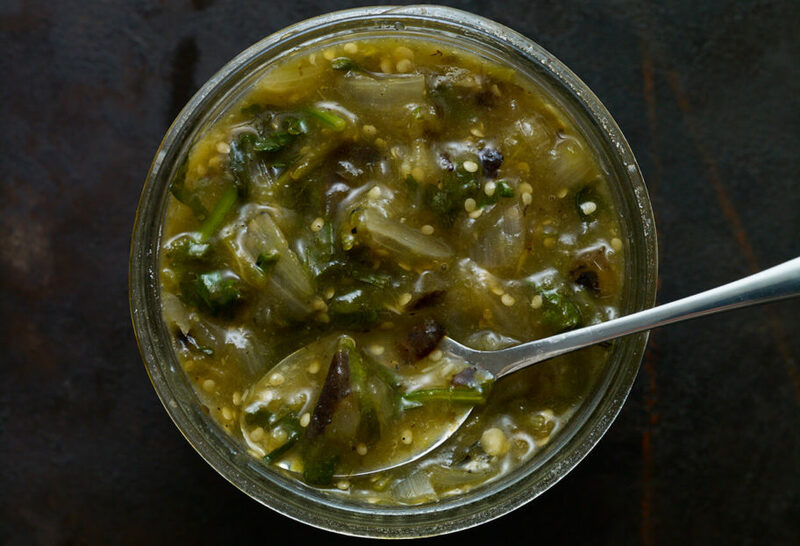 In the jar of a blender, place the tomatillos and their juices, chile, onion and garlic. Also add cilantro and salt. Puree to your desired texture, you may leave it chunky or puree until smooth. I was wonder if I could can this salsa. If so, is there anything it is best to add to the salsa until the day it is served? Yes…just follow your normal canning process. And it is good to go…no need to anything to it when you serve it, Mary. trying to find today’s recipes for your daddy crispy chicken and your corn salad. Made this last nice. A real winner. Congratulations on your James Beard award. I bet you are eliated. How long will the salsita keep in the fridge, and can it be frozen? Absolutely amazing, I love your shows, and have tried a number of recipes. Absolutely the best. I used this as a salsa and also to make chili verde. Can you tell me the best use for this salsa? Chips? As a base gravy for hot dishes? Thanks. Hi Pati. I love your shows. Would this to tomatillo Salsita be good to use as an enchilada sauce?